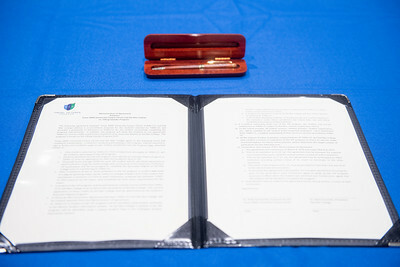 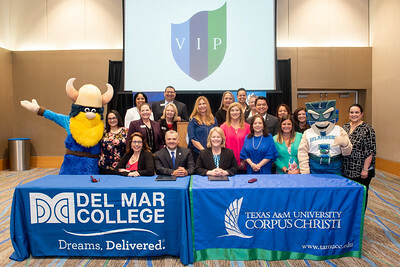 Texas A&M University-Corpus Christi and Del Mar Sign New Memorandum of Agreement (MOA). 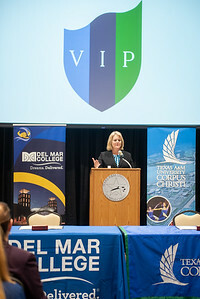 Wednesday, May 2 at the Texas A&M University-Corpus Christi. 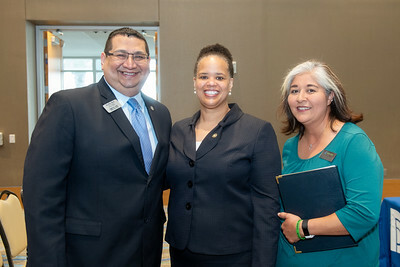 Rito Silva (left), Dr. Clarenda Phillips, and Sandra Martinez. 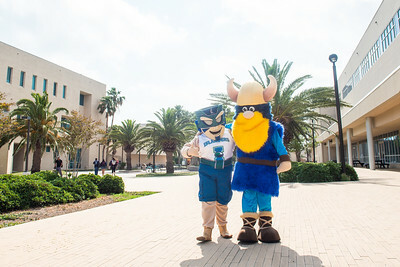 Texas A&M University-Corpus Christi's Izzy the Islander (left), and Del Mar College's Valdar the Viking. 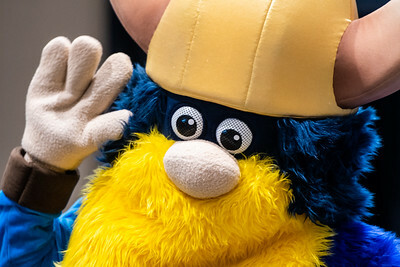 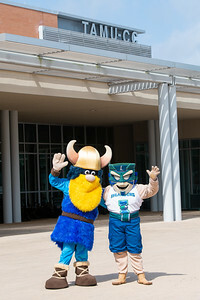 Del Mar College's Valdar the Viking. 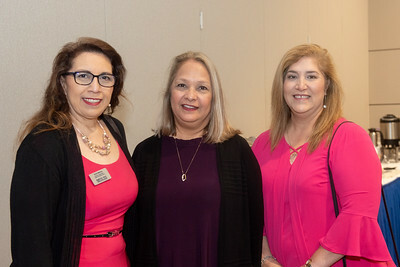 Gracie Martinez (left), Jeannie Gage, and Patricia Dominguez. 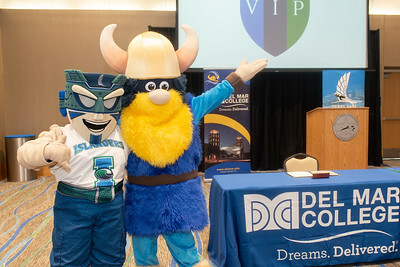 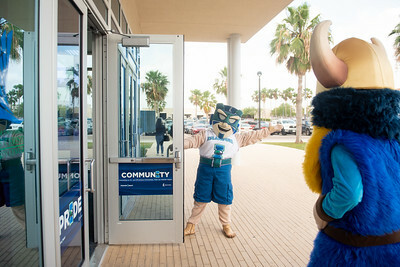 Del Mar College's Valdar the Viking (left), Dr. Mark Escamilla, Del Mar College president, and Texas A&M University-Corpus Christi's Izzy the Islander. 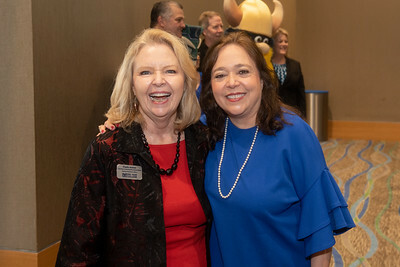 Claudia Jackson (left), and Margaret Dechant. 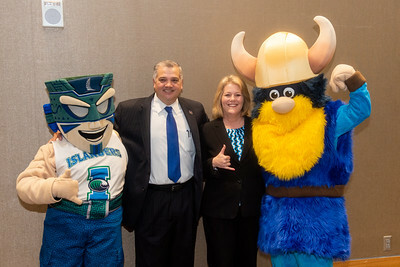 Izzy the Islander (left), Dr. Kelly M. Quintanilla, president and CEO of Texas A&M University-Corpus Christi, Dr. Mark Escamilla, Del Mar College president, and Valdar the Viking. 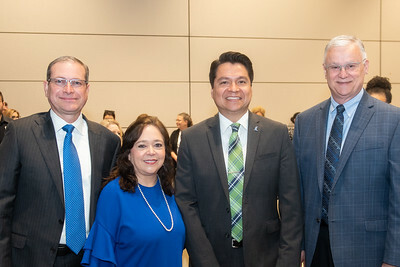 Terry Tatum (left), Margaret Dechant, Oscar Reyna, and Don Albrecht. 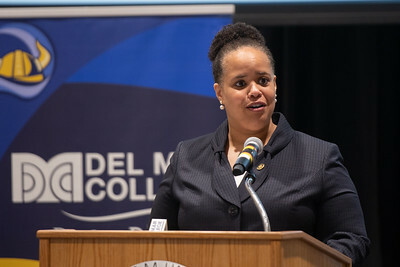 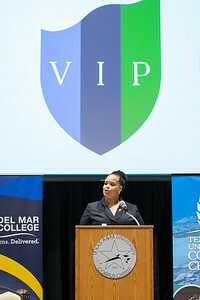 Provost and Vice President for Academic Affairs, Dr. Clarenda Phillips, welcomes guests to the Texas A&M University-Corpus Christi and Del Mar MOA signing ceremony. 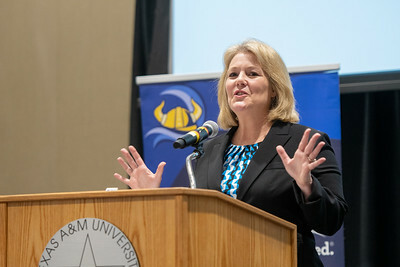 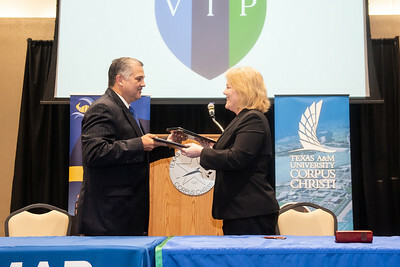 Dr. Kelly M. Quintanilla, president and CEO of Texas A&M University-Corpus Christi. 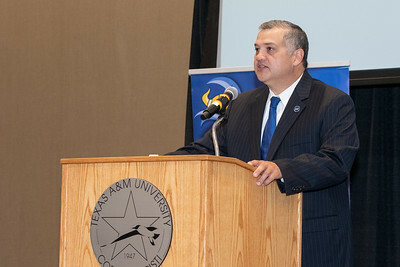 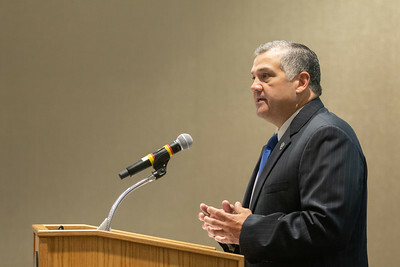 Dr. Mark Escamilla, Del Mar College president. 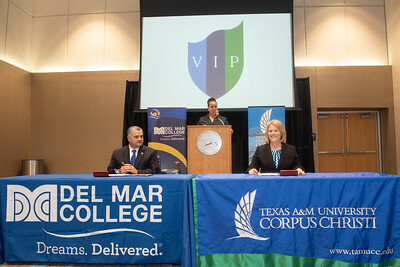 Dr. Mark Escamilla, Del Mar College president (left), and Dr. Kelly M. Quintanilla, president and CEO of Texas A&M University-Corpus Christi. 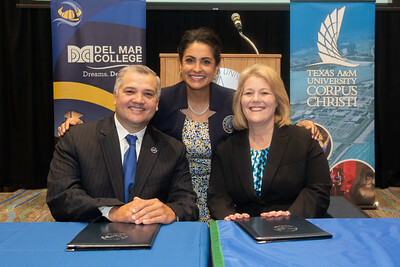 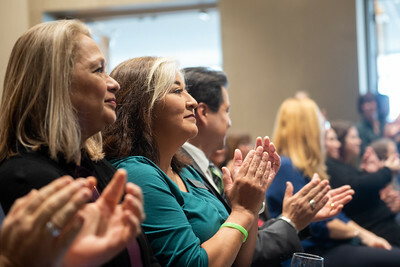 Dr. Mark Escamilla, Del Mar College president (left), Corpus Christi City Council Member at Large Paulette Guajardo, and Dr. Kelly M. Quintanilla, president and CEO of Texas A&M University-Corpus Christi. 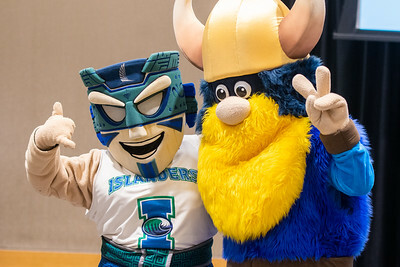 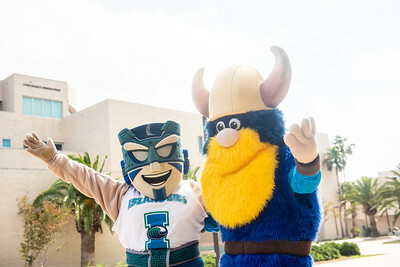 Del Mar College's Valdar the Viking (left), and Texas A&M University-Corpus Christi's Izzy the Islander.